Opening April, 1, 2017!! 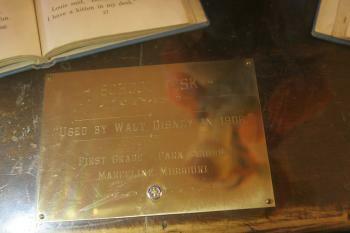 Walt Disney Hometown Museum in Marceline, Missouri: This location holds more of the magic of the Disney Youth than any other! Tigger Travels - Family Adventure Journal Photos From Tigger`s Travels and MORE! 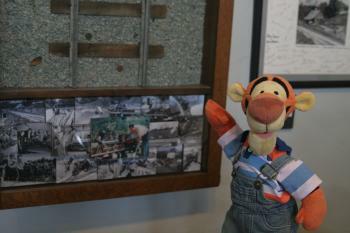 Tigger found a piece of Walt's passion project! 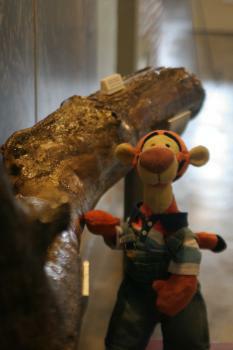 Tigger touches a piece of Walt and Ruth Disney's dreaming tree! Inez takes a few minutes to pose with our favorite bouncer!! 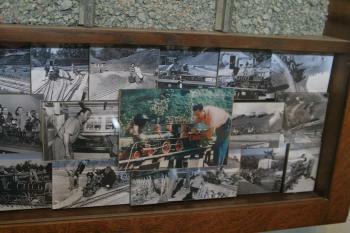 Every American and so many people around the world know at least part of the story of Walt Disney. For some it may just be the end of the story with the success of Mickey Mouse and the plethora of Princesses, Royalty, Villains and thousands of characters who find their seeds in the imagination of this true visionary! 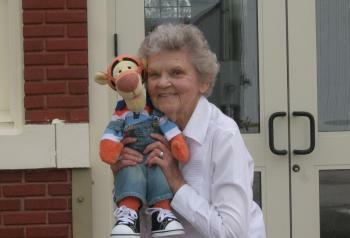 Inez Johnson certainly knows more of the story than most, she and her husband hosted the Disney's (Walt, Roy and their wives) for their first big return to this quaint rural town in the center of Missouri. They had built the first brick home with air conditioning in Marceline and in 1946 they agreed to host the new hometown celebrities and quickly became life long friends. Inez has played a key role in bringing much of that story for everyone to share in the Walt Disney Hometown Museum now located in the very train station that his oldest two brothers used to run away from the family farm back to their last home town of Chicago... well, not the VERY train station, but it is in the same location! For only $10 you have access to the whole museum located on the two floors of the train station as it exists today, a brick edifice built by the Santa Fe railroad company that served as one of their main locations in the American Midwest. When you visit, take the tour first! They will bring you up to speed on the WHOLE story of the Disneys beginning with Walt's first important responsibility to care for his younger sister Ruth while the older boys were to tend the farm. (Yeah, the one they ran away from in pretty short order!) His responsibilities delayed his starting school till he was seven years old when his sister would also begin school. 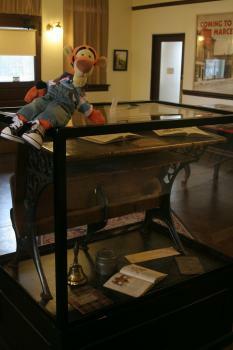 One of the Highlights of the first room of the tour is Walt Disney's second grade desk! 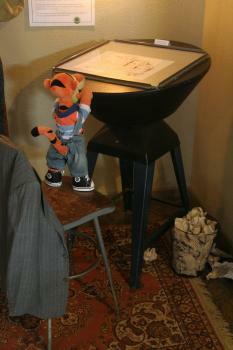 Of course, the skeptic will ask, "But how do they KNOW it is his desk?" The second room contains a tribute to Walt and Roy's returns to their beloved Marceline including one of the very cars that were given to the city to build a track and people could ride! It was actually an old ride from Disneyland that was being replaced. Across the gift shop in the center of the first floor are three more rooms with treasures from the Disneys, their studios as well as families and friends. 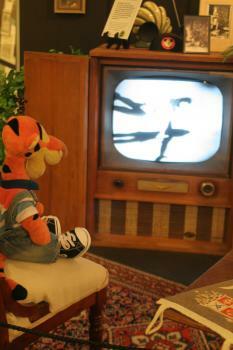 One of Tigger's FAVORITE things was the ACTUAL television that Walt purchased for his parent to watch the grand opening of Disneyland! They watched Art Linkletter's exciting naration of events that unfolded that day as Elias and Flora Disney (Walt and Roy's parents) looked on from the safety of their livingroom because they were concerned about the big crowds that were sure to be there. Upstairs in the museum is a very large room that has been divided into five or six sections. 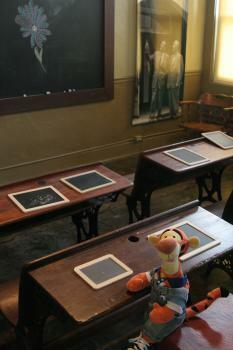 The first on the left is the recreation of a classroom much like those attended by the young Disney children and to the right is a recreation of the Disney front porch including the tar drawing Walt innocently made on the wall to entertain his younger sister one day. That drawing stayed for many years in tribute to the children's creativity... or because no amount of elbow grease could remove the solidified tar from the wall! Half way into this large room on the left is the very light table that was used by Walt Disney in 1919 and kept in a personal collection for over 30 years! 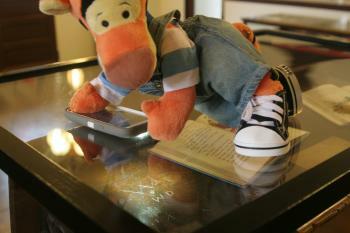 Tigger feels chills as he stood in the very spot great characters came to life! The largest area of this upstairs room is occupied by a very impressive collection of scale models of the buildings created in Disneyland in the 1950s. As a teenager Dale Varner began his own contructions of Main Street USA in his parent's basement. 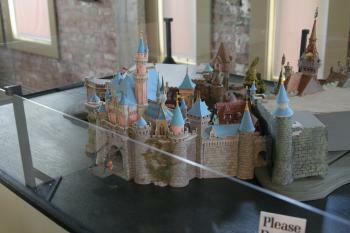 After impressing Walt with pictures of his early creations Dale was furnished with a set of Disneyland blueprints, setting off a lifetime obsession to re-build his model in exact scale to the blueprints. After 40 years he offered his passion project to the Walt Disney Hometown Museum for permanant display, now available for all to see! 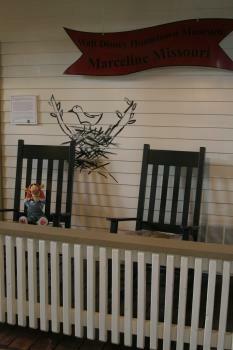 As you take the tour, pay particular attention to the stories Walt told his sister under their dreaming tree... This tree has fallen since and a piece of a branch can still be seen and touched at the entrance to this upstairs room! 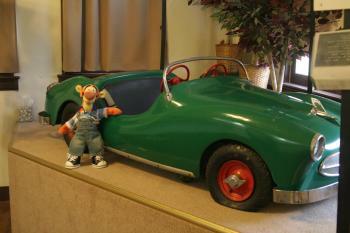 If any object contained the magic of the Disney childhood, this piece certainly must! To this day, some guests are lucky enough to receive a tour from Inez herself. She spends time there during open hours but be sure to check the web site for when they are open between April 1 and October 31 of each year. NOTE: One exciting event coming up is October 22, 2016 when Becky Cline, Director of the Disney Archives will be speaking to guests! 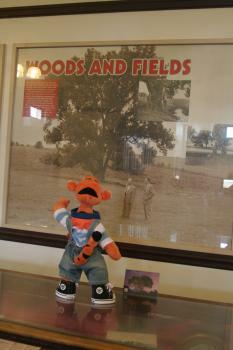 To find out more visit the Museum's web site events page. 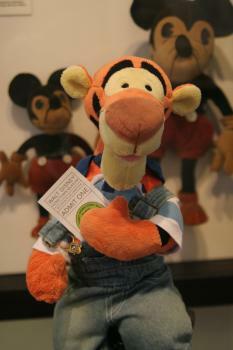 Tigger hopes to get there! 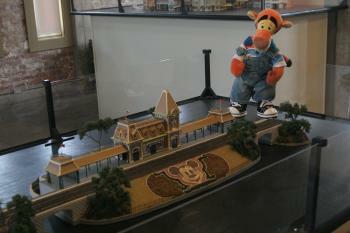 Also, you can follow the Walt Disney Hometown Museum on FACEBOOK and Twitter.